Have you ever heard of the St. Mary's Annunciators? How about the Appleknockers of Geneva, N.Y., aka AL Winneck Post #396? These and many other corps existed long before the inception of Drum Corps International in 1972. But their legacies are not left behind – Corpsreps.com, an online database initiated by drum corps enthusiast Chris Maher, today helps preserve the history of thousands of corps. Corpsreps.com didn't develop overnight. In the mid-90s, before the Internet had reached the forefront of today's society, the website emerged as a model. "Corpsreps started as a training project for me in 1995 as I became interested in dynamic websites," said Maher who is the president of Modotech, a software company specializing in products for insurance companies. "The original Corpsreps prototype was limited to the repertoires of the top 12 DCI corps from each year," he said. 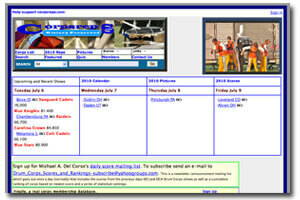 With the help of several volunteers, Corpsreps.com now includes scores, photos, repertoires, and other historical data on more than 2,000 drum corps throughout the world. A tremendous list of 1,278 junior corps and 236 senior corps, both active and inactive, are currently catalogued on the "Corps List" index. This year, Maher has made several improvements to the site. "The new site features a 'Search All' option which looks for your search phrase throughout the system rather than having to decide to search a corps name, song title or composer," Maher said. He also says corps photos are integrated into various parts of the site so that visitors can see galleries from a specific contest or corps program that they search for. Maher has been involved with drum corps for nearly four decades: "I saw my first show in 1972 and was hooked." He spent two years marching as a member of the Westchester Horizons of New York in the percussion section. Though the group folded in April of 1975, Maher continued following the activity. "I remained a fan and volunteer since that time, and for the past eight years I've had the absolute joy of being a drum corps parent," he said. Explore the history of drum corps at Corpsreps.com.